Tesla Model S to win prestigious Motor Trend Car of the Year award? After having just picked up Automobile Magazine’s 2013 Car of the Year Award, Tesla Motors has a lot to be proud of. Not only has the California startup delivered one of the most stylish and fuel-efficient cars on the market, it’s also managed to win the hearts and minds of automotive purists long skeptical of anything that doesn’t run on drudged up dinosaur bones. But will the accolades stop at Automobile Magazine? Will the Model S manage to snap some other awards this year, raising its profile and credibility even further? It sure looks that way. While we have yet to find anything concrete, we did some digging around and stumbled upon a post in the Tesla forums that suggests the Model S may be in line to snag Motor Trend’s prestigious Car of the Year award as well. 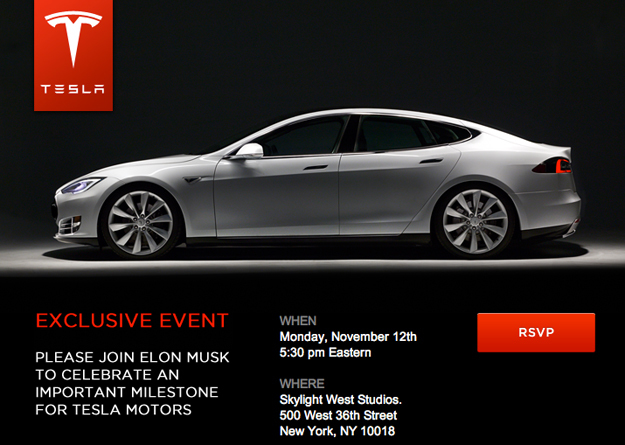 According to the Tesla Motors Club forums, the company will be holding a special and very exclusive event, on Monday, November 12 at Skylight West Studios in New York. The event invite, pictured here, says that CEO Elon Musk will be in attendance to celebrate an “important milestone” for Tesla Motors. Speculation on the forum suggests the unveiling of Tesla’s first East Coast supercharging station, and while that seems perfectly plausible, November 12 also happens to be the same day Motor Trend announces its Car of the Year winner. Again, nothing has been confirmed, and it all may end up being coincidence — but if it turns out to be true, this will indeed be a very big milestone for Tesla and further cement the legitimacy of Tesla’s ambitious project, while also boosting the credibility of electric cars as a whole.